So who's enjoying the sunshine? I am. I know I do my fair share of complaining about being hot and sticky but I love it really. And I'd better get used to it as the heatwave is here to stay. I was checking an extended weather forecast yesterday and it looks set to stay until the end of August. Which is fab but not great for spending time in the kitchen baking. I'd rather be sweating in the garden with my feet up than sweating over a hot stove. I've barely baked at all for the past few weeks so instead have been rustling up easy no bake desserts. 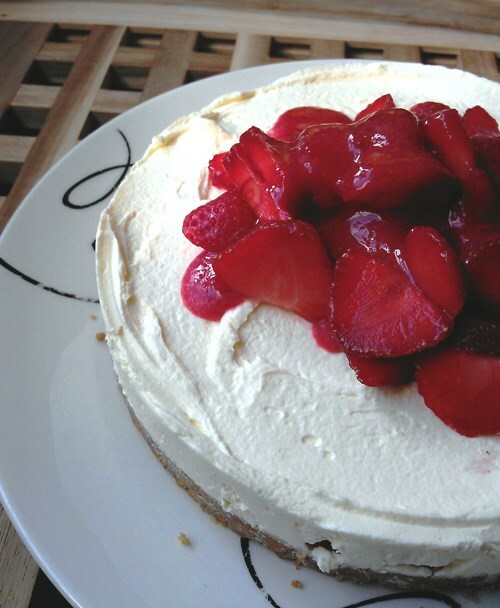 This strawberry cheesecake is so easy that I'd go as far as saying anyone can make it. There are only four steps to making it. It's completely foolproof. And it's absolutely delicious and perfect for summer. 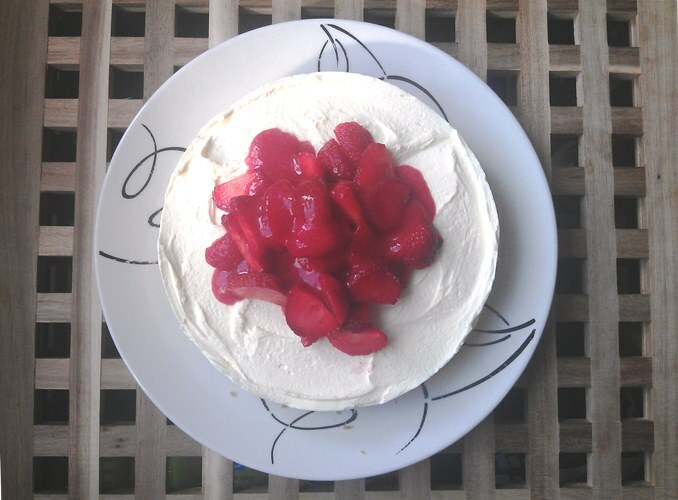 I made it last week when we went to my parents for tea and it was a huge hit... except with Lydia who for some strange reason doesn't like cheesecake! Lightly butter of a 23cm loose-bottomed tin with baking parchment. Put the digestive biscuits in a plastic food bag and bash with a rolling pin to make fine crumbs. Transfer the crumbs to a bowl, then add the melted butter. Mix thoroughly then tip into the prepared tin and press down firmly into the base to create an even layer. Pop in the fridge to chill for 1 hour until firmly set. Put the cream cheese, icing sugar and vanilla extract in a bowl, then beat with an electric mixer until smooth. Tip in the double cream and continue beating until the mixture is completely combined, it will thicken but don't overbeat as this will thicken it too much. Now spoon the cream mixture onto the biscuit base, making sure that there are no air bubbles. 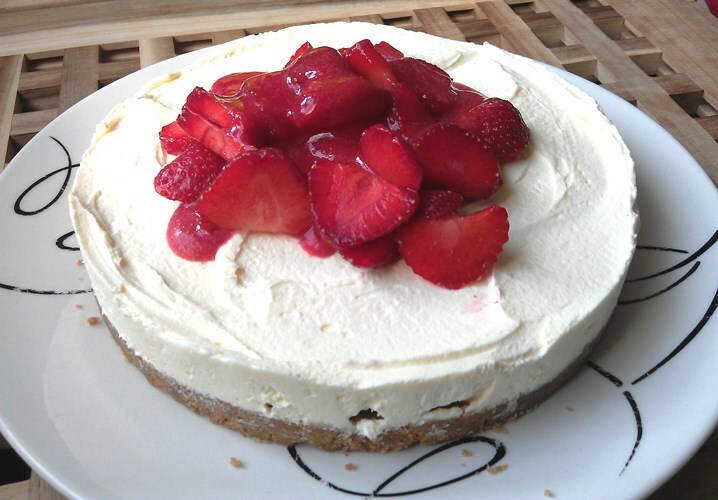 Smooth the top of the cheesecake down with the back of a dessert spoon or spatula. Leave to set in the fridge for at least 3 hours but preferably overnight. To serve, place the cake tin on top of a can or glass, then slowly pull the sides of the tin down. Slip the cake onto a serving plate, removing the lining paper and base. Purée half the strawberries in a blender or food processor with the icing sugar and water. If you want a smooth puree, push the blended strawberries through a sieve to get rid of all the seeds and bits. Slice the remaining strawberries and pile onto the cake, then pour over ther purée. 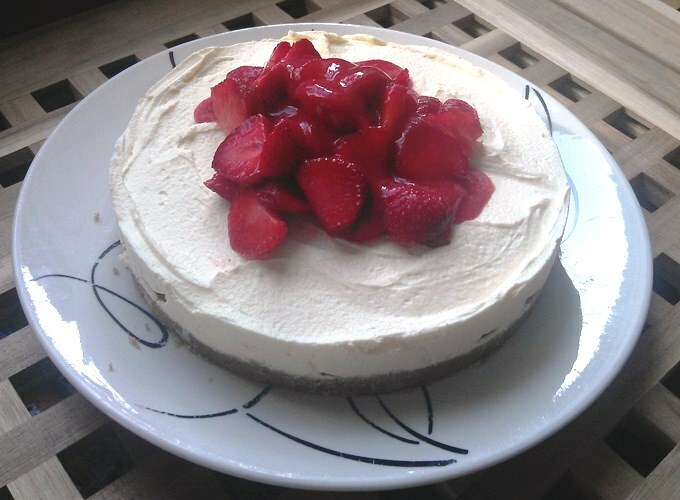 For more no-bake recipes take a look the dessert section of my recipe page here.